For patients who experience a limited benefit from hearing aids, there are implantable options available. The type of implant needed will be determined by your audiologist based on a number of candidacy criteria. 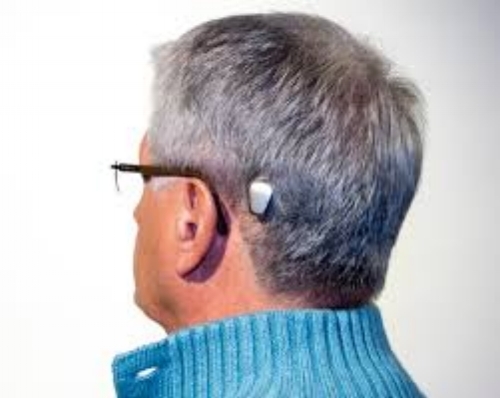 BAHA, or Bone Anchored Hearing Aid, is a hearing device that relies on direct bone conduction to transmit sound. This surgically implanted device bypasses the auditory canal and middle ear, utilizing bones as a pathway for sound to reach the middle ear. It is an alternative for people with chronic ear infections, congenital external auditory canal atresia and single-sided deafness. These patients usually do not benefit from conventional hearing aids. Cochlear implants are hearing loss treatment devices used for patients with sensorineural hearing loss who are unable to use or fully benefit from hearing aids. These devices are surgically implanted and provide direct electrical stimulation to the auditory nerve. They also have an external component worn on the skull in the area behind the ear. Cochlear implants are recommended when severe to profound hearing loss is present and benefit from traditional amplification is minimal.